Designed and manufactured in Europe, the Mondeox Brenta trekking boots are ideal for light hiking, traveling, hunting or even for casual wear. 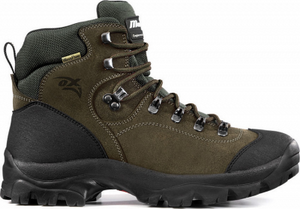 These hikers are made ​​of soft leather upper with Cordura nylon and tough composite materials for the toe & heel cup for protection against knocks and bumps. For comfort out on the trails, the Brenta sports a double density shock absorbing midsole to reduce stress on your joints. Well-spaced lugs also help with braking on slippery surfaces and remain responsive in bogged down trails.